A short account of the circus clown duo Bim-Bom and their encounter with the Cheka in revolutionary Russia. 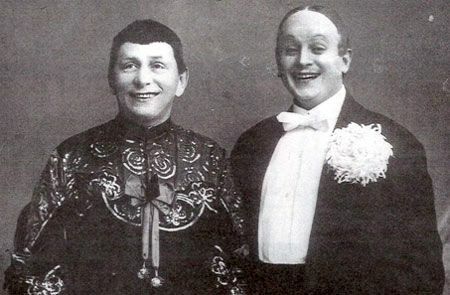 Bim-Bom was a celebrated Russian circus clown duo. It consisted of Ivan Semenovich Radunsky (1872-1955) as Bim and various individuals playing the part of Bom over the years. The act started up in 1891 and the first Bom was played by Russified Italian Felix Cortesi. When Cortesi was drowned in an accident in 1897 his part was taken by the Pole Mieszyslaw Stanevsky (Polish Stanievsky). The duo used unconventional musical instruments like frying pans, brooms, saws and business cards to parody classical music pieces and also engaged in acrobatic routines. From 1905 the satirical element within the act became more pronounced with the clowns’ wit aimed at the Tsarist regime and much of the acrobatics and music making dropped. Innocent sounding non sequiturs disguised a sly and biting criticism of the establishment. Between 1901 and 1904 Bim-Bom performed throughout Europe, in Berlin, Budapest, Paris and Prague. They appeared in early films and on early recordings, indicating their great popularity. Whilst Radunsky retained a standard clown outfit, Stanevsky eschewed this and wore little makeup and a huge chrysanthemum in the buttonhole of his smart tuxedo. Whilst Radunsky played the role of a naïve and simple soul, Stanevsky played a slightly tipsy man about town. Between 1914 and 1919 Radunsky was director of the Salamonsky Circus in Moscow and in 1914-1918 one of the organisers of the Russian Society of Variety and Circus Artists (ROAVTSA). Bom ran the popular artistic café BOM on Tverskoy boulevard, frequented by people like the Left SR and Chekist Yakov Blumkin, the Menshevik Internationalist Martov, the writer Ilya Ehrenberg, and the performing clown Vladimir Durov (see Stalin, Vol. I: Paradoxes of Power, 1878-1928 by Stephen Kotkin). Radunsky had been a member of the Bolshevik Party and had been an early member of the Futurist moment. After the October Revolution of 1917 the duo continued with their satires of the new government. One skit involved Bim appearing on stage with framed portraits of Trotsky and Lenin and being asked what he was planning on doing with them. “I’ll hang one, and put the other against the wall” was the reply. Naturally these jokes did not go down too well with the Bolsheviks. The American journalist George Seldes in his Witness to a Century: Encounters with the Noted, the Notorious, and the Three SOBs (2011) reminisces about seeing Bim-Bom and recounts some of their jokes. The leading Chekist Yakov Peters recounted an action against Bim-Bom in 1924 in Vospominaya o rabote v Vchk v pervyi god revolutsii (From memories of work in the Cheka in the first year of the revolution), in the historical journal Proletatarskaya Revoliutsia, no. 10 (33). This article was later republished by M.P. Eroshnikov in his compilation, Morning of The Soviet Union in 1988. The Cheka had established themselves in Moscow in early 1918 at Bolshaya Lubyanka 11, which had previously housed the Yakor (Anchor) Insurance Company and Lloyds of London(The Cheka had been established in December 1917. Its first executions were those it carried out on February 26, 1918, against two bandits - the self-styled Prince Eboli (Makovsky, Dolmatov) and his girlfriend Britt, who carried our robberies using false Cheka documents.This was followed by the shooting of the anarchists V. Smirnov and I. Zanoz, members of Petrograd Anarchist Communist Federation, for "banditry" two days later on the 28th February, well before the attacks on anarchist centres in major cities on April 12th 1918 onwards). Some members of the central staff of the Cheka found themselves at the circus on March 27th 1918 watching Bim-Bom’s performance. During one of the reprises the duo began one of their customary skits of the new regime. The Chekists took umbrage and came on stage to arrest Bom.The audience thought this was part of the fun but Bom realised what was happening and fled, upon which the Chekists began to fire their Browning handguns in the air, panicking the audience. Bom escaped and hid in the circus stables. The next day the duo, still in their costumes, were questioned by the Cheka. This incident was met with derision in the still unmuzzled non-Bolshevik press. For his part, Peters did not disapprove of action against the clowns but considered that the Chekists should have waited until after the performance. He noted that “Muscovites received the Cheka badly”, not seeming to realise that it was incidents like this and another when a group of Chekists stopped for a drink in a tavern, overhead some criticisms of the Bolsheviks and opened fire, killing seven “hooligans”, which caused such a bad reception.. The Bim-Bom incident is often inaccurately reported in Western accounts with the book KGB (1990) by Christopher Andrew and Oleg Gordievsky describing Bim-Bom as an individual rather than a duo. Orlando Figes, in his A People’s Tragedy: A History of the Russian Revolution (1997) repeats this mistake and then states that Bim-Bom was shot in the back, with several hundreds of people attending his funeral! Peter Julicher in his “Enemies of the People” Under The Soviets (2015) repeats the story about the shooting of the clown. Adam Ulam in his The Bolsheviks: the intellectual and political history of the triumph of communism in Russia (2009) states that whilst Bom escaped shooting, several of the audience were shot. One begins to question the accuracy of these historians. In 1920 Stanevsky went to Poland followed in about 1922 by Radunsky.The act was revived resulting in more recordings. Radunsky returned to the Soviet Union in 1925 where he restored the act with Nikolai Viltsak as the new Bom. He had learnt not to use satire in the act and returned to the old musical routines. They were both awarded the title Honoured Artist of The Soviet Union in 1939. In 1941 Viltsak was replaced by Nikolai Kamsky. Between 1946 and 1948 Radunsky performed solo He died in 1955. He published his memoirs a year after the death of Stalin. Alexander Serafimovich’s Civil War novel The Iron Flood (1924) describes an incident when a detachment of Red Army soldiers discover a record of Bim-Bom’s record The Laugh which consists entirely of laugh after laugh. The soldiers themselves are completely overcome and paralysed by mirth, to the consternation of their commander. The message is clear, Bim-Bom’s humour is counter-revolutionary. Another circus clown, Drozhin, became a Chekist torturer in Russian Turkestan. After the October Revolution of 1917 the duo continued with their satires of the new government. One skit involved Bim appearing on stage with framed portraits of Trotsky and Lenin and being asked what he was planning on doing with them. “I’ll hang one, and put the other against the wall” was the reply. Naturally these jokes did not go down too well with the Bolsheviks. The leading Chekist Yakov Peters recounted an action against Bim-Bom ... Some members of the central staff of the Cheka found themselves at the circus on March 27th 1918 watching Bim-Bom’s performance. During one of the reprises the duo began one of their customary skits of the new regime. The Chekists took umbrage and came on stage to arrest Bom.The audience thought this was part of the fun but Bom realised what was happening and fled, upon which the Chekists began to fire their Browning revolvers in the air, panicking the audience. Bom escaped and hid in the circus stables. The next day the duo, still in their costumes, were questioned by the Cheka. This incident was met with derision in the still unmuzzled non-Bolshevik press. For his part, Peters did not disapprove of action against the clowns but considered that the Chekists should have waited until after the performance. He noted that “Muscovites received the Cheka badly”, not seeming to realise that it was incidents like this and another when a group of Chekists stopped for a drink in a tavern, overhead some criticisms of the Bolsheviks and opened fire, killing seven “hooligans”. Not a laugh a minute under 'the proletarian state' then, even in early 1918 - the Cheka deciding for all what could be laughed at. Great stuff, thanks for writing/posting!